What makes Roadware 10 Minute Concrete Mender different from other concrete repair products? Roadware 10 Minute Conrcete Mender™ is a two-part polyurethane that penetrates deep into concrete to make permanent repairs. Nearly thin as water at less than 9cps, Concrete Mender™ actually injects itself into the matrix of the concrete and shores up the existing concrete as well as making the repair. Concrete Mender™ eliminates the bond-line as it Microdowels into the concrete. We call it Microdowling™. Permanent repair in 10 minutes. In just minutes after application, Concrete Mender™ cures to a tough 4500psi polymer concrete that transfers heavy loads throughout the repair area. No more pop outs. Use a standard 1:1 ratio 600ml cartridge application gun. See Cartridge Application Instructions. For precise application. Choose from 14, 15 or 18 gauge. Full depth crack injection without pumps or ports. Easy to use Sift-tip injection mixers make full depth crack injection possible. Bulk mix application for larger cracks and spalls. Available in one gallon containers, two-gallon kits. Simply add sand and mix by hand. Also available in ten-gallon kits. One gallon of Concrete Mender™ makes about 2.2 gallons of repair material when combined with 2 parts silica sand. 2X the yield of epoxy or polyurea. See our Product Estimator. Roadware 10 Minute Concrete Mender double in volume with combined with two parts 4030 manufactured sand. Roadware 10 Minute Concrete Mender™ has a strong history of repairing shrinkage cracks and spalls in elevated structures such as parking decks, bridges, and airport terminals. Concrete Mender™ is considered a structural polyurethane and can be used where the surrounding concrete is stable. Structural Polyurethane– A polyurethane based material that restores structural integrity and aggregate interlock to distressed concrete by using low surface tension and low viscosity to penetrate concrete surfaces and cross -linking polymer chains to bond directly to the concrete-aggregate matrix. This bonding action utilizes capillary forces to self-inject polymer chains into the surrounding concrete. This material should have a modulus of elasticity less than the surrounding concrete and should not become brittle over time. This material may be combined with manufactured sand to form a PCC compatible polymer concrete that can structurally repair concrete cracks and spalls. Advantages– Due to the very low surface tension of the material and low viscosity, complete saturation bonding of cracks can be easily achieved. Minimal prep to remove loose debris is all that is normally required. This can be considered a structural repair if the material is allowed to gravity flow to the full depth of the crack. Manufactured sand or quartz may be introduced into the repair as necessary to prevent under slab ponding and material waste. For repair greater than 0.125 inches, specified sand may be added at a ratio of two parts sand to one part mixed polyurethane as the crack is filled to extend the material and add strength. The sand also brings the thermal coefficient of expansion of the repair material closer in-line with surrounding concrete. Polyurethanes of this nature may be applied in a wide range to sub-straight temperatures making them useful in frozen and cold storage warehouse applications or cold weather application below -20F (-23C). Repairs are typically ready to accept traffic in approximately 10 minutes at 72F (22C). Limitations- The surrounding concrete must be surface dry, cured for at least 60 days. Finished repairs may, “yellow” in appearance over time when exposed to UV sunlight. In exterior conditions, only low to non-movement cracks should be repaired. Roadware 1006-15 Static Mixer 24 element with 15 gauge needle application tip. Roadware 1006-STR Static Mixer 24 element with 3/8″ soft Easy-injection tip. Is it really just like Concrete Mender™? 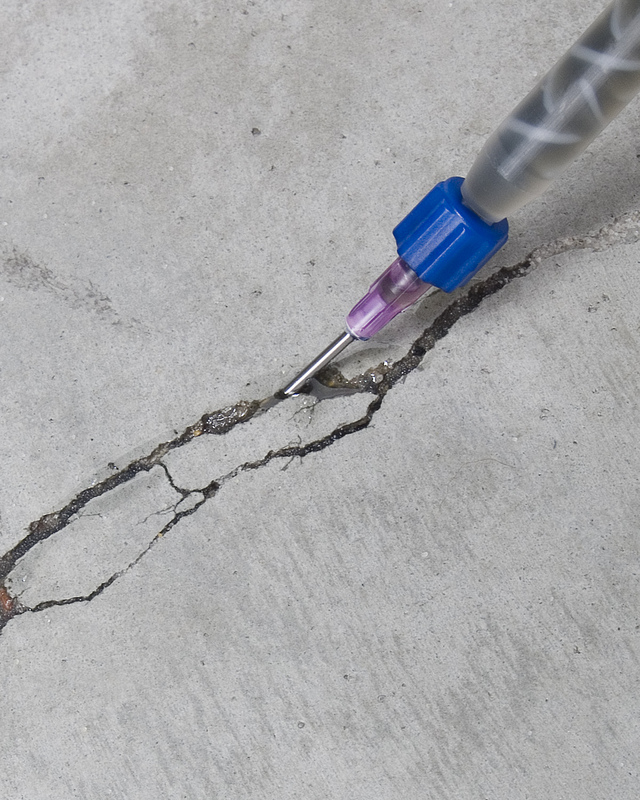 Use Roadware needle tip injection to repair hairline cracks in concrete floors.